mademoiselle bagatelles: Gigi on Sale! Good news! 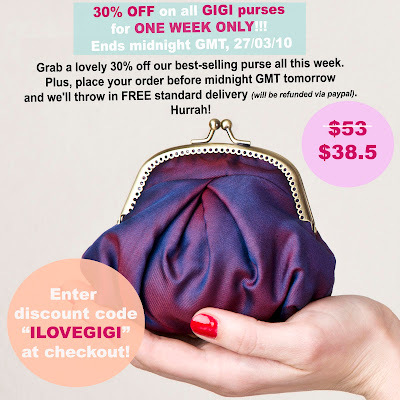 All the Gigi purses are now in sale all this week! Plus FREE SHIPPING until tomorrow midnight GMT! Perfect timing for Mother's Day (in the UK, Mother's Day is on April, 3rd)! Hurrah! Bonnes nouvelles! Toutes les pochettes Gigi sont maintenant en solde toute la semaine! Plus LIVRAISON GRATUITE jusqu'à minuit GMT demain! Super timing pour la Fête des Mères (au Royaume-Uni, la Fête des Mères est ce 3 avril), he he! Hourra! I found your stuff on Wedding Bee and have just loved this clutch purse idea as gifts for wedding party/girls. Some lovely photos and almost spring!